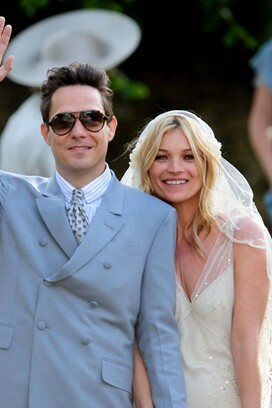 As we all know, fashion icon and eternal party girl Kate Moss married Kills' guitarist Jamie Hince today in a private ceremony in the Cotswold. The first pictures have emerged and she looks simply stunning. The dress, by disgraced fashion designer and long time friend of Moss, John Galliano, gives a nodded to Kate's signature style, vintage-inspired and gorgeous embellished. It's obvious Jamie Hince didnt want to forget about his rock and roll roots either in a blue YSL suit and 1950's teddy boy hair. 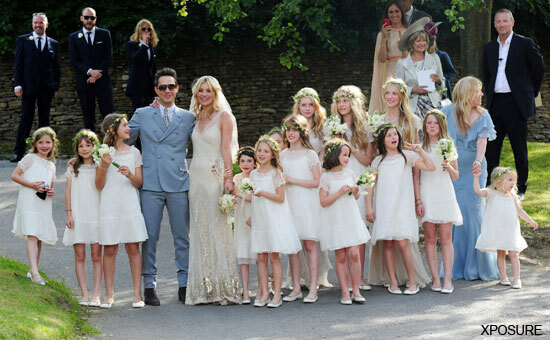 Can't wait for more photos to be released.The official wedding photographer was Mario Testino, although I doubt we'll ever get to see them if Kate stays true to her secretive ways.